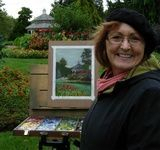 '90-Present Instructor, Figure Drawing & Painting, Pastel & Plein-Air Painting, Ann Arbor Art Ctr. May 2006 Juror, EMU Student Exhibition, Eagle Crest Convention Ctr. 9-'83 -11-'98 Graphic Designer, Chrysler Corporation and Cushing-Malloy, Inc.
Spring 2014 Publication: “SAVING Land”, Land Trust Alliance, Washington D.C.
May 2006 MTV “M.A.D.E.” – Facilitator for Figure Drawing Session at the Ann Arbor Art Ctr.